It’s now fall so bring on the textures. 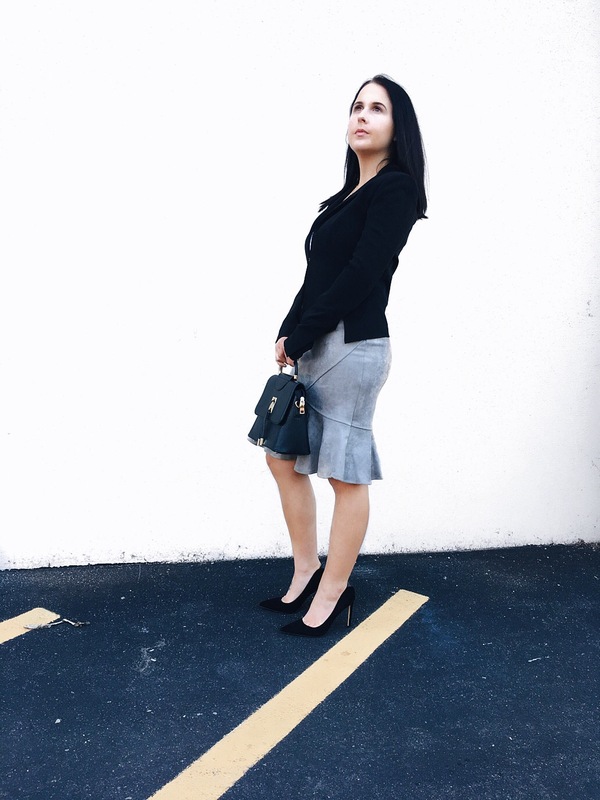 I love the warmth a suede skirt can add to an outfit. This mermaid skirt was a go too for me in the past few days. It actually helped me land a pretty big job interview with more than what I was expecting going in there. And how cool is this metal detailed leather tote. I’m so into the gold hardware details. This skirt and bag are both from www.rosegirl.com. I’m extremely impressed with rosegirl and the great items they have sent me. Normally, when you purchase fast fashion you don’t get the quality. This site I must say has the quality and the latest trends. None of the products smelled like chemicals, and if you shop discount fashion, you definitely know what I mean. For an amazing deal on a statement piece or just a trend for your closet, I definitely recommend this site. I finished the look with these amazing black suede pumps by Sam Edelman. I purchased this shoe from Shopbop a year ago but posted a link, with picture, to Neimans. If they still have your size consider this pump an essential item in your wardrobe and is extremely versatile. Can’t wait to style this pump in up coming outfits. How are you adding in fall textures? So chic! Love the bag and shoes! Love this skirt, so pretty. I love your bag! So office appropriate yet chic and fashionable! I think the same thing! !